Relationships after Fishbein et al. (2001), Hilu et al. (2003), and Fishbein and Soltis (2004). Saxifragales are a morphologically diverse group, including annual and perennial herbs, succulents, aquatics, shrubs, vines, and large trees. Saxifragales include the well-known families Saxifragaceae, Crassulaceae, Cercidiphyllaceae, Grossulariaceae, Paeoniaceaea, and Hamamelidaceae. Other members include Altingiaceae, Daphniphyllaceae, Haloragaceae, Iteaceae, and Pterostemonaceae. Prior to molecular phylogenetics (Morgan and Soltis, 1993; Fishbein et al., 2001), members of this clade were classified based on morphology, in three subclasses from the six recognized in recent classifications (Cronquist, 1981; Takhtajan, 1997, reviewed in Morgan and Soltis, 1993; Qiu et al., 1998; Soltis et al., 2005). Analysis of rbcL sequences first revealed the Saxifragales clade (Chase et al., 1993; Morgan and Soltis, 1993). Investigation of atpB alone, as well as atpB + rbcL, also indicated a monophyletic Saxifragales, but none of these studies provided support > 50% (Chase and Albert, 1998; Savolainen et al., 2000). 18S rDNA alone and 18S rDNA + rbcL revealed a Saxifragales clade with moderate jackknife support (e.g., D. Soltis et al., 1997, 1998; D. Soltis and Soltis, 1997). Most recently, in analyses of three or four-gene data sets (rbcL, 18S rDNA, atpB) (Hoot et al., 1999; D. P. Soltis et al. 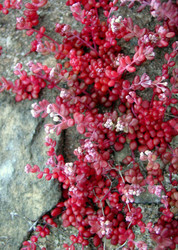 1999, D. Soltis et al., 2000), the monophyly of Saxifragales received strong support. Saxifragales include trees, shrubs, lianas, annual and perennial herbs, succulents, and aquatics. Flowers vary considerably in arrangement, merosity, and degree of fusion of perianth parts, stamen and carpel number, ovary position, and degree of syncarpy (Cronquist 1981; Takhtajan 1997). Due to the great morphological diversity found in this clade, synapomorphies for the group are not clear. Possible synapomorphies include a partially fused bicarpellate gynoecium, a hypanthium, and glandular leaf teeth (Judd et al., 2002). Aspects of leaf venation and wood anatomy are similar in the woody members of the clade: solitary vessels, scalariform perforations, opposite to scalariform intervessel pits, nonseptate fibers with distinctly bordered pits, and apotracheal parenchyma (Baas et al., 2000). Exceptions to this suite of features occur, however, in Crassulaceae and Saxifragaceae, but in these primarily herbaceous families, woodiness probably arose secondarily (Carlquist, 1988; Mort et al., 2001). A seed character represents a possible synapomorphy for the core members of the Saxifragales clade. An exotestal palisade with thickened outer walls (Nandi et al., 1998) is found in Saxifragaceae, Ribes (Grossulariaceae), Crassulaceae, and Paeoniaceae. However, Hamamelidaceae are characterized by mesotestal seeds (see Corner, 1976 for a review of angiosperm seeds). Whereas the composition of Saxifragales is now clear, the position of the clade among the core eudicots remains uncertain. Initial analyses of rbcL sequences (Chase et al., 1993) placed the order as sister to all rosids, while analyses of atpB sequences placed Saxifragales as sister to a large clade of most core eudicots (Savolainen et al., 2000a). None of these placements received support > 50%. The three-gene analysis (P. Soltis et al., 1999; D. Soltis et al., 2000) placed Saxifragales as sister to rosids, but with only weak jackknife support (60%). However, in spite of the weak support (e.g., D. Soltis et al., 2000), the simple, pentamerous flowers have long been thought to indicate a relationship with Rosaceae and other rosids, but whether these floral features are synapomorphies for Saxifragales + rosids or symplesiomorphies (i.e., shared ancestral features) is unclear. Additional research is needed to resolve the relationship of Saxifragales within the core eudicots. The analyses of a four-gene data set for eudicots revealed a placement of Saxifragales as sister to all other core eudicots except Gunnerales and Berberidopsidales (D. Soltis et al., 2003), but without support > 50%. Analysis of matK placed Gunnerales sister to other core eudicots, followed by a trichotomy of Saxifragales, rosids, remaining core eudicots (Santalales, asterids, Caryophyllales, Berberidopsidales) (Hilu et al., submitted). Thus, it appears likely that Saxifragales occupies a pivotal position near the base of the core eudicot radiation. Molecular data also demonstrated that the initial diversification of Saxifragales was rapid (Fishbein et al., 2001). These data further suggested that the early diversification of Saxifragales was contemporaneous with the initial radiation of the major lineages of eudicots and that of non-eudicot (magnoliid and monocot) angiosperms. Molecular data suggesting an early diversification also agree with the fossil record in that fossils attributed to Saxifragales are present in Turonian-Campanian strata (89.5 mya), which is comparable in age to the oldest fossils of core eudicots (Magallón et al., 1999; Soltis et al., 2005). 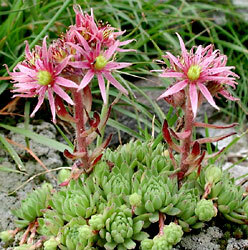 Several members of Saxifragales were considered closely related in some classifications. Saxifragaceae, Grossulariaceae, Iteaceae, Pterostemonaceae, Penthoraceae, and Tetracarpaeaceae were previously considered part of a much more broadly defined Saxifragaceae sensu lato (Engler, 1928; reviewed in Morgan and Soltis, 1993). A close relationship of these core families of Saxifragaceae s. l. to Crassulaceae was also proposed (e.g., Cronquist, 1981; Takhtajan, 1987, 1997). Hamamelidaceae, Altingiaceae, Cercidiphyllaceae, and Daphniphyllaceae were also considered closely related in modern classifications (e.g., the “lower hamamelids” sensu Walker and Doyle, 1975). However, Saxifragales also include Haloragaceae and Paeoniaceae, families that have never been placed with any members of Saxifragales in previous classifications. Haloragaceae have been placed in or near the rosid order Myrtales (Cronquist, 1981), whereas Paeoniaceae have been considered closely related to Magnoliaceae (e.g. Worsdell 1908), Ranunculaceae (e.g., Takhtajan 1997), or Dilleniaceae (e.g. Cronquist, 1981). The inclusion of Aphanopetalum (previously placed in the rosid family Cunoniaceae) in Saxifragales initially seemed surprising, but was suggested previously based on anatomical data (Dickison et al., 1994). Phylogenetic analyses of a five gene-data set identified two well-supported clades of families in Saxifragales (Fishbein et al., 2001). Strong support was found for a Saxifragaceae alliance of Saxifragaceae and several woody members of the former Saxifragaceae s. l. 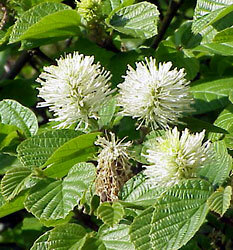 (i.e., Grossulariaceae, Iteaceae, and Pterostemonaceae). Within this clade Ribes (Grossulariaceae) was found to be the immediate sister to Saxifragaceae, followed subsequently by a clade of Iteaceae , Pterostemonaceae. A second strongly supported clade within Saxifragales consists of a well-supported Crassulaceae (see Mort et al., 2001) as sister to a clade of Tetracarpaea (Tetracarpaeaceae), Penthorum (Penthoraceae), Haloragaceae, and Aphanopetalum (Cunoniaceae). Tetracarpaea, Penthorum, and Aphanopetalum are all small genera that should be included within an expanded family Haloragaceae (APGII, 2003). The Saxifragaceae alliance and Crassulaceae , Haloragaceae form a clade in the strict consensus of shortest trees, but this clade does not receive support > 50% in parsimony analyses. However, this sister group relationship is weakly supported (68% bootstrap) in maximum likelihood analyses (Fishbein et al., 2001) and strongly supported using Bayesian inference (1.00 posterior probability; Fishbein, unpubl.). A considerable amount of sequence data (i. e. Fishbein et al., 2001; D. Soltis et al., 2000; Hoot et al., 1999) has been unable to resolve some of the critical deep relationships among clades within Saxifragales. A large core clade consisting of Saxifragaceae and Crassulaceae , Haloragaceae is evident in all shortest trees, but does not receive support greater than 50%. Furthermore, relationships among this core group, and the remaining families (Paeoniaceae, Cercidiphyllaceae, Daphniphyllaceae, Hamamelidaceae, and Altingiaceae) also remain unclear (Feng et al., 1998; Qiu et al., 1998; Hoot et al., 1999; Savolainen et al., 2000; Fishbein et al., 2001; D. Soltis et al., 2000). In maximum likelihood analyses of a five-gene data set, Fishbein et al. (2001) recovered an optimal topology with Daphniphyllaceae and Hamamelidaceae sister to the remaining members of the clade; however, the precise branching order of these two early-diverging members of Saxifragales was unclear. Following Daphniphyllaceae and Hamamelidaceae, Altingiaceae, Cercidiphyllaceae, and Paeoniaceae appeared as successive sisters to a core clade of Saxifragaceae and Haloragaceae , Crassulaceae. Fishbein et al. (2001) also showed that the poor resolution obtained in Saxifragales is not due to violations of assumptions or to combining data partitions having conflicting histories or processes. Rather, their analyses suggest instead that the initial diversification of Saxifragales was indeed rapid. APG II (Angiosperm Phylogeny Group). 2003. An update of the Angiosperm Phylogeny Group classification for the orders and families of flowering plants. Botanical Journal of the Linnean Society 141:399-436. Baas, P., E. Wheeler, and M. Chase. 2000. Dicotyledonous wood anatomy and the APG system of angiosperm classification. Botanical Journal of the Linnean Society 134:3-17. Carlquist, S. 1988. Comparative wood anatomy. Springer. Berlin. Chase, M. W. and V. A. Albert. 1998. A perspective on the contribution of plastid rbcL DNA sequences to angiosperm phylogenetics. In: D. E. Soltis, P. S. Soltis, and J. J. Doyle [eds. ], Molecular Systematics of Plants II: DNA Sequencing, Kluwer, Boston. Chase, M. W., D. E. Soltis, R. G. Olmstead, D. Morgan, H. D. Les, B. D. Mishler, M. R. Duvall, R. A. Price, H. G. Hills, Y.-L. Qiu, K. A. Kron, J. H. Rettig, E. Conti, J. D. Palmer, J. R. Manhart, K. J. Sytsma, H. J. Michaels, W. J. Kress, K. G. Karol, W. D. Clark, M. Hedrén, B. S. Gaut, R. K. Jansen, K.-J. Kim, C. F. Wimpee, J. F. Smith, G. R. Furnier, S. H. Strauss, Q.-Y. Xiang, G. M. Plunkett, P. S. Soltis, S. M. Swensen, S. E. Williams, P. A. Gadek, C. J. Quinn, L. E. Eguiarte, E. Golenberg, G. H. Learn Jr., S. W. Graham, S. C. H. Barrett, S. Dayanandan, and V. A. Albert. 1993. Phylogenetics of seed plants: an analysis of nucleotide sequences from the plastid gene rbcL. Annals of the Missouri Botanical Garden 80:526-580. Corner, E. J. H. 1976. The seed of Dycotyledons. Cambridge University Press, New York. Cronquist, A. 1981. An Integrated System of Classification of Flowering Plants. Columbia University Press, New York. Dickison, W. C., M. H. Hils, T. W. Lucansky, and W. L. Stern. 1994. Comparative anatomy and systematics of woody Saxifragaceae Endl. Botanical Journal of the Linnean Society 114:167-182. Engler, A. 1930. Saxifragaceae. In: A. Engler and K. Prantl [eds. ], Die Natürlichenn Pflanzenfamilien, 2nd ed. Engelmann, Leipzig. Fishbein, M., C. Hibsch-Jetter, D. E. Soltis, and L. Hufford. 2001. Phylogeny of Saxifragales (Angiosperms, Eudicots): Analysis of a rapid, ancient radiation. Systematic Biology 50:817-847. Hoot, S. B., S. Magallón, and P. R. Crane. 1999. Phylogeny of basal eudicots based on three molecular data sets: atpB, rbcL, and 18S nuclear ribosomal DNA sequences. Annals of the Missouri Botanical Garden 86:1-32. Judd, W. S., C. S. Campbell, E. A. Kellogg, P. F. Stevens, and M. J. Donoghue. 2002. Plant Systematics: a Phylogenetic Approach. Sinauer, Sunderland, MA. Morgan, D. R. and D. E. Soltis. 1993. Phylogenetic relationships among Saxofragaceae sensu lato based on rbcL sequence data. Annals of the Missouri Botanical Garden 80:631-660. Mort, M. E., D. E. Soltis, P. S. Soltis, J. Francisco-Ortega, and A. Santos-Guerra. 2001. Phylogenetic relationships and evolution of Crassulaceae inferred from matK sequence data. American Journal of Botany 88:76-91. Nandi, O. I., M. W. Chase, and P. K. Endress. 1998. A combined cladistic analysis of angiosperms using rbcL and nonmolecular data sets. Annals of the Missouri Botanical Garden 85:137-212. Qiu, Y. L., M. W. Chase, S. B. Hoot, E. Conti, P. R. Crane, K. J. Sytsma, and C. R. Parks. 1998. Phylogenetics of the Hamamelidae and their allies: parsimony analyses of nucleotide sequences of the plastid gene rbcL. International Journal of Plant Sciences 159:891-905. Soltis, D. E., M. E. Mort, P. S. Soltis, C. Hibsch-Jetter, E. A. Zimmer, and D. Morgan. 1999. Phylogenetic relationships of the enigmatic angiosperm family Podostemaceae inferred from 18S rDNA and rbcL sequence data. Molecular Phylogenetics and Evolution 11:261-272. Soltis D. E. and P. S. Soltis. 1997. Phylogenetic relationships in Saxifragaceae sensu lato: a comparison of topologies based on 18S rDNA and rbcL sequences. American Journal of Botany 84:504-522. Soltis D. E., C. Hibsch-Jetter, P. S. Soltis, M. Chase, and J. S. Farris. 1997. Molecular phylogenetic relationships among angiosperms: an overview based on rbcL and 18S rDNA sequences. In: K. Iwatsuki and P. H. Raven [eds. ], Evolution and Diversification of Land Plants. Springer, Tokyo. Soltis D. E., P. S. Soltis, M. E. Mort, M. W. Chase, V. Savolainen, S. B. Hoot, and C. M. Morton. 1998. Inferring complex phylogenies using parsimony: an empirical approach using three large DNA data sets for angiosperms. Systematic Biology 47:32-42. Soltis D. E., A. E. Senters, M. Zanis, S. Kim, J. D. Thompson, P. S. Soltis, L. P. Ronse de Craene, P. K. Endress, and J. S. Farris. 2003. Gunnerales are sister to all other core eudicots: implications for the evolution of pentamery. American Journal of Botany 90:461-471. Soltis D. E., V. A. Albert, S. Kim, M.-J. Yoo, P. S. Soltis, M. W. Frohlich, J. Leebens-Mack, H. Kong, K. Wall, C. dePamphilis, and H. Ma. 2005. Evolution of the flower. In: R. Henry [ed.]. Diversity and Evolution of Plants. CABI Publishing, Wallingford, UK. Takhtajan, A. 1997. Diversity and Classification of Plants. Columbia University Press, New York. Walker, J. W. and J. A. Doyle. 1975. The bases of angiosperm phylogeny: palynology. Annals of the Missouri Botanical Garden 62:664-723. Worsdell, W. C. 1908. The affinities of Paeonia. Journal of Botany 46:114-116.